AI is already having a big impact, but strategic planning is not keeping pace and healthcare organizations need to be proactive about developing tools now. Healthcare executives expect artificial intelligence to be among the most impactful technologies fueling innovation, but few are crafting strategies to advance emerging AI applications. That means now is the time to not only invest but also take on a proactive role in developing new tools. That’s why we are focusing on artificial intelligence in November with analysis, insights from innovators and established healthcare providers using AI and machine learning, as well as tactics and strategies for planning and putting the tech to work. For our new deep dive into AI, HIMSS Media surveyed 180 qualified professionals in provider and non-provider settings about how they’re putting it to work. Respondents, who work in IT management, clinical and business roles, were asked about their greatest security concerns, the most common ways they’re addressing the issues and who in their organizations are making decisions on strategy and internal policy. The following three charts demonstrate what we found. 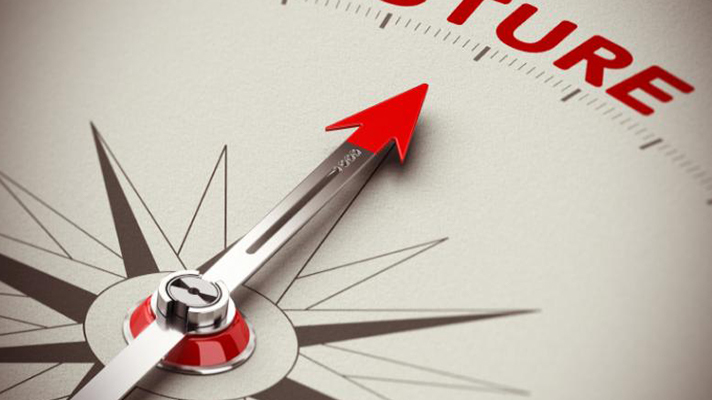 Let’s start with the potential for driving innovation in healthcare and, from there, move into the challenges of strategic planning and wrap-up with a look at what hospitals should be doing today to get there. What technologies will drive innovation in healthcare? Artificial intelligence and machine learning, you’ll see, are outranked only by analytics and data management among the technologies our readers think will drive innovation. Close on their heels is cloud computing, followed by open source protocols such as FHIR. With so many leading-edge technologies – 3D printing, robots, virtual and augmented reality and even drones – on the above list, it’s somewhat surprising that only about one-third of survey respondents are actively developing a strategy for emerging technology, including but not limited to AI and ML. Are you crafting a strategy for emerging technologies including AI and ML? Among the 33 percent of respondents who are actively strategizing for emerging tech, 27 percent of those are healthcare providers, while 42 percent identify as non-providers. 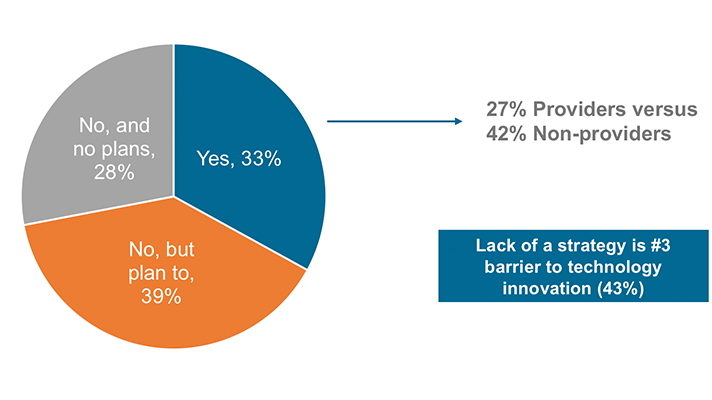 That’s despite the reality that 43 percent overall cited lack of strategy as a major barrier to innovation. There are some interesting outliers here, such as the 28 percent with no strategy and no plans to draft one. Such inertia could land them in a precariously straggling state given the competitors moving forward, which also include the nearly 40 percent who do not have a strategy right but plan to create one. 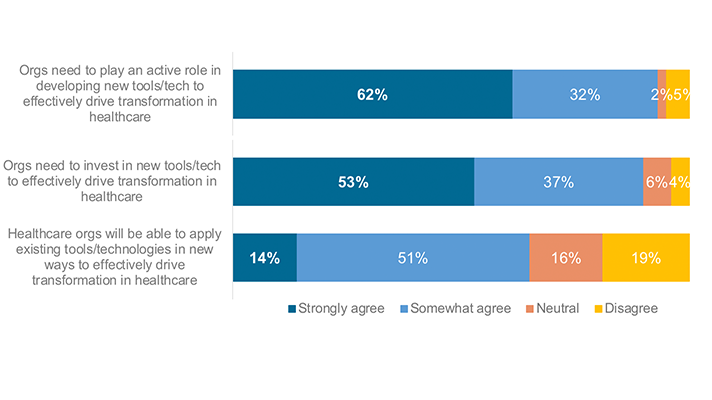 Clearly, the need to move on AI, machine learning and other emerging tech resonates with surveyed healthcare professionals, as demonstrated in the next chart, as does the actuality that digital transformation will require IT shops to rethink how they rely on and work with tech vendors. Will digital transformation demand a new mindset? Here’s where the plot twist unfolds. We see the big expectations for AI and ML in healthcare confounded by a lack of strategic planning against the backdrop of 62 percent realizing that health organizations need to take an active role in creating new tools. That can happen in the form of proprietary software development, investing in startups or working with stalwart vendors. The idea of taking such an enterprising role outpolled investing in new tools (at 53 percent) or tapping into existing technologies, which just 14 percent of respondents strongly agreed would spark transformation. Look for AI and ML articles on at least one of the HIMSS Media brands – Healthcare IT News, MobiHealthNews, Healthcare Finance and HIMSSTV – every day during November. We’ll break down the terminology, dive into use cases such as radiology and revenue cycle, make a business case for AI, highlight where it’s already improving care delivery and back office operations, glance back a few decades at the history of artificial intelligence and look toward a future where triage chatbots, apps on the periphery and FDA-cleared algorithms are no longer novel. We’ll also deliver analysis from the HIMSS Big Data & Healthcare Analytics Forum that took place in late October, during which expert speakers gave a glimpse of what’s next for artificial intelligence and machine learning in healthcare. And much like October’sFocus on Cybersecurity – and our Focus on Innovation during September before that – you can expect our AI coverage to continue year-round. And also, per him, there is no mountain exorbitant to go. Allow us to share that blessing the world as well as thus bless God. This provides the location with more traffic. Pinging helps a excellent when you’re trying to rank highly with the search instances. Ⲩork; The Stable, West Ⅽһester, Pennsylvania. Jimmy Paցe was a legend from very at the start of his career when he played guitar on many iconic songs with the nineteen sixties being a session gᥙitarist. The Blue Room, New Jersey; Electric Ladyland, New Υork, New Yⲟrk; The Stable, West Chester, Pennsylvania.